The University of Utah Seismograph Stations (UUSS, quake.utah.edu) invites applications for a one-year appointment as Postdoctoral Research Associate in Earthquake Seismology. The successful applicant will work with UUSS faculty, staff, and students on problems of earthquake detection, location, and characterization in the Intermountain West. Potential research topics include (1) application of template detection methods to seismicity induced from geothermal and mining operations, as well as to naturally occurring seismic swarms and aftershock sequences, (2) high-resolution, multi-event relocation using methods such as Bayesloc and HypoDD, (3) estimation of full moment tensors for small-to-moderate seismic events using waveform inversion and first motion polarities, (4) discrimination of tectonic earthquakes from induced earthquakes and non-earthquake sources. While primary datasets are available from regional seismic networks, in some cases supplemental data will be generated using the University of Utah pool of 95 three-component, short-period (5 Hz) Nodal seismometers. The successful applicant will be expected to participate in the Nodal seismometer field campaigns. In addition to research, the successful applicant will be expected to serve rotations as a UUSS duty seismologist (leading the initial UUSS response to events of interest), which will periodically require 24/7 availability via cell/pager. A Ph.D. in geophysics or a related field is required at the time of appointment. The position is renewable for a second year, pending acceptable progress and availability of funding. Opportunities for teaching, mentoring, and outreach will be made available for those interested in pursuing an academic track. To apply submit a cover letter, a curriculum vitae, a statement of research interests, and contact information for three references to the following webpage: https://utah.peopleadmin.com/postings/52629. The nominal start date is July 1, 2016, however there is flexibility in the actual start date. Review of applications will begin immediately. Questions may be directed to UUSS Director Keith Koper (koper@seis.utah.edu) or UUSS Associate Director Kris Pankow (pankow@seis.utah.edu). The University of Utah Seismograph Stations reports that a light earthquake of magnitude 4.1 occurred at 07:01 AM on May 25, 2016 (MDT). 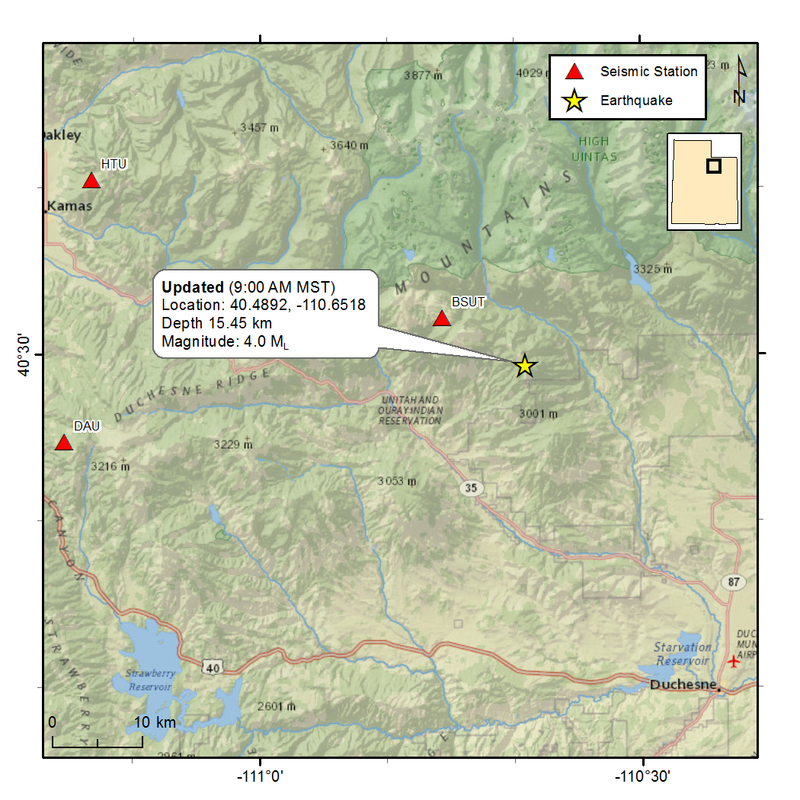 The epicenter of the shock was located in the southern Uinta Mountains, 8 miles NE of the town of Hanna, Utah, and 26 miles NW of Duchesne, Utah. Seven earthquakes of magnitude 3.0 or greater have occurred within 16 miles of the epicenter of this event since 1962. The largest of these events was a magnitude 4.5 on September 30, 1977, 21 mi NNW of Duchesne. Anyone who felt the earthquake is encouraged to fill out a survey form either on the Seismograph Stations website: www.quake.utah.edu or the US Geological Survey website: earthquake.usgs.gov. The University of Utah Seismograph Stations (UUSS) commemorated 50 years of earthquake monitoring, research, education and outreach with a celebration held April 8, 2016 in the Frederick Albert Sutton Building on the University of Utah campus. The celebration was also an occasion to recognize the efforts and contributions of UUSS founding director, Dr. Kenneth L. Cook. Sign points arriving guests to the Frederick Albert Sutton Building. Special guests attending the celebration included family and friends of Dr. Cook, including his daughters, Carla Rae Cook and Shauna Cook Clinger. Also in attendance were representatives from both Rio Tinto Kennecott and the Utah Division of Emergency Management; faculty, staff, and students from the College of Mines and Earth Sciences – including Dean Francis H. Brown; and former UUSS staff members. A permanent historical display, describing the role Dr. Cook played in the founding and development of UUSS, has been installed outside the Rio Tinto earthquake information center in the foyer on the first floor of the Sutton Building. In conjunction with the celebration, members of the UUSS staff conducted tours of the earthquake information center. The celebration also included a program held in the Rev. Marta Sutton Weeks Lecture Hall. UUSS Director, Dr. Keith D. Koper welcomed attendees and shared opening remarks. Dr. William P. Johnson, Incoming Chair gave remarks on behalf of the Department of Geology and Geophysics. Dr. Walter J. Arabasz, former UUSS Director, presented “Historical Perspective on the University of Utah Seismograph Stations,” with particular emphasis on the organization’s development during the tenure of its first director, Dr. Kenneth L. Cook. Shauna Cook Clinger presented a life sketch of her father, Dr. Kenneth L. Cook, illustrated with photos from his early years. Carla Rae Cook shared several childhood remembrances of her father. In closing, Dr. Keith Koper spoke about UUSS today and into the future. He noted the potential involvement of UUSS in the development of an earthquake early warning system for the State of Utah. Following the program, guests enjoyed dinner and visiting in the Sutton Building confluence. Historical display honoring Dr. Kenneth L. Cook and the founding and early years of UUSS. Martha Knowlton (left) and Dr. Jim Pechmann (center) both of UUSS discuss the display with Dr. Paul Jewell of the Department of Geology and Geophysics. UUSS Seismic Network Manager, Valeriu Burlacu, gives a tour of the Rio Tinto Earthquake Information Center. UUSS Associate Director, Dr. Kristine Pankow presents an overview of Utah seismicity to tour participants. Attendees gather in the lecture hall prior to the program. Dr. Keith Koper, welcomes attendees. Dr. William Johnson, offers remarks on behalf of the Department of Geology and Geophysics. Dr. Walter Arabasz, gives an overview of the early history of UUSS. Carla Rae Cook shares remembrances of her father, UUSS founding director, Dr. Kenneth L. Cook. Dr. William Johnson (left) with department colleagues, Dr. Tony Ekdale and Kim Atwater; and Dr. Francis H. Brown (right), Dean of the College of Mines and Earth Sciences. Buffet line in the Sutton Building confluence. Dr. Walter Arabasz (standing) stops to chat with (l to r) John Crofts, Judy Watanabe, and Bill Carey of the Utah Division of Emergency Management; and former UUSS staff member Paula Oehmich. Dr. Jim Pechmann (left) visits with former UUSS staff members (l to r) Erwin McPherson and Bill Richins and spouse. Video recording of program speakers – program outline below. 2015 has been another vibrant and productive year for the University of Utah Seismograph Stations (UUSS). Our longstanding partnership with the United States Geological Survey (USGS) was extended with a new, 5-yr cooperative agreement from the USGS Earthquake Hazards Program. This award ensures that earthquake monitoring in Utah will continue to operate with state-of-the-art equipment and software at least through 2020. Congratulations to the UUSS staff for all their hard work on the USGS proposal, it was truly a team effort. The legacy of UUSS in earthquake monitoring and research was recognized in 2015 as two former UUSS Directors received prestigious awards for career accomplishments. Research Professor Emeritus Dr. Walter J. Arabasz received the 2015 Alfred E. Alquist Special Recognition Medal from the Earthquake Engineering Research Institute, while Professor Emeritus Dr. Robert B. Smith received the 2015 Paul G. Silver Award from the American Geophysical Union. Congratulations to Walter and Bob for the leadership and service they have provided to the seismological community over the last several decades. UUSS developed a new monitoring capability in 2015 with the acquisition of nearly 50 new wireless seismographs. The instruments were purchased in collaboration with Dr. Fan-Chi Lin and other University of Utah geoscientists, and will allow for the imaging of shallow Earth structure at a very small scale as well as the detection of small aftershocks that follow regional earthquakes. Please look inside to read about one of the first experiments carried out with the new instruments. We expect great new things in 2016 as well. Keep an eye out for an updated UUSS web page and expanded social media presence. We also look forward to a celebration of the 50th anniversary of UUSS, in April 2016.